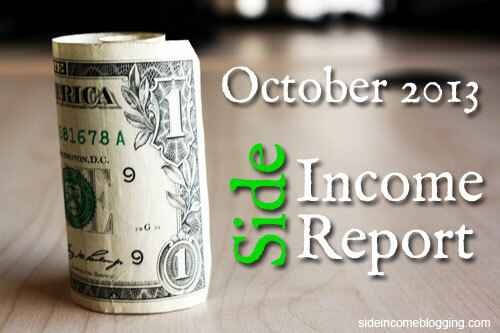 I’m really excited to share this October’s Side Income Report with you. My side income earnings are composed of two revenue sources: 1) My services business where I provide website design, coding and consulting services and 2) Income from my various websites and niche sites. While not my overall best month, October was the best month for my website/niche site income I’ve had in a very long time! If my current revenue holds true, November will be even better. I often talk about how earning money online is a slow journey, and that for a long time it seems like it just might be a waste of time, then all of the sudden traffic begins to increase, earnings begin to grow, and you have a sudden success. I think October was that month for me. But enough fluff, let’s jump into the real numbers! Total income from my websites was $958.20, that’s more than a 100% increase over last month, and more than a 400% increase over prior months this year!! Needless to say, I’m very excited. An article I wrote about genesis child themes continued to rank on page #1, resulting in a large amount of affiliate income. One of my niche sites is ranking very well for it’s target keywords, and has high conversion rate. The income from this site for October is low as Amazon pays two months “in the rears”, but future months will be really good. My “lifestyle” blog, Blue Ridge Mountain Life continues to be very popular on Facebook and is beginning to rank for a few search keywords. Affiliate commissions from this site are low, but Adsense revenue is doing well. A great month, and it exceeded the $1000.00/month goal I am shooting for. Once I obtain that goal consistently, I’ll bump it up. As I mentioned, I’m seeing strong traffic and revenue growth on two of my seven sites: Blue Ridge Mountain Life and my blood pressure monitor niche site. Most of the traffic for our Blue Ridge Mountain Life site comes from Facebook and our Facebook page has over 8,000 likes. People really enjoy the pictures we post of the Blue Ridge Mountains. On the blood pressure monitor site, I recently made some changes that really helped with conversion rates, and my search engine rankings continue to increase weekly. Growth here on Side Income Blogging still continues to be pretty flat, but I’m ok with that. I continue to average around 200 visits per day. But even at that traffic level, Side Income Blogging still makes up a large portion of my monthly income. Overall, a great month and my income is trending in the direction I’ve been wanting it to go. I would really like to move away from a services based income to a more passive income source from my various websites. Great stuff and congratulations on the growth. Just curious… is that a neverblue ad on your sidebar (the fiverr ad)? If so, I didn’t see them on the income report. Any success at all with them? Thanks Adam – Yes it is, and no success at all, not a single conversion and only a few clicks. Most of the offers by NeverBlue don’t really appeal to me and to be honest appear a bit scammy. Plus their application and approval process is painful. Thank for sharing your income report here. I am doing each month as well on my blog. But I earned only $243 on October which is less a lot than yours. I hope I could increase it by focusing more on Genesis. I love it and I think if I write more about it, I could generate some revenue from its affiliate. Perhaps Santel, the trick is to rank well for genesis related keywords. That income was due to an article I wrote that rank on page 1 for a particular genesis related key phrase for almost two months. Unfortunately it’s now fallen back to page 2. The trick is to get on page 1 for something that gets a decent amount of searches. Just keep at it, your income will grow. Great report here…love the transparency! It will be fun for you to look back in a few months/years and have your growth recorded. Best of luck as we head into 2014! Wow! Great job Larry, you did awesome with adsense! Is that from multiple sites? Keep Moving Larry, that’s what it’s all about! I appreciate your transparency and real advice as always. I’m doing a lot of research around Google+, a lot is changing, and changing a lot! Do you spend much time in +? Thanks for the report! Hey Justin and thank you. Always felt that if I was telling people how to make money, that I should be able to back that up with real numbers. Jason, yes that is from multiple sites, but the majority of the income is from Blue Ridge Mountain Life, which gets most of it’s traffic from Facebook. Hey Julia, I did spend a lot of time on Google+, but pulled back some as I found time spent writing more content and focusing on my sites resulted in higher revenue. Google+ is a great network, and I enjoy the interaction, but I have to pay the bills, and can drive more converting traffic using Facebook.